In Part 1 of our expert roundtable, we discuss how B2B selling today has become incredibly complex—with products, with customers and with their own internal sales process—and what it takes to create an environment where sales professionals can be more successful. Hey everybody, it's Brent Adamson here coming to you from Las Vegas in the CEB Sales and Marketing Summit. I'm so excited to be joined today by a panel of incredibly well-known experts in the field that I want to spend some time with today talking about what we see happening in the world of sales. 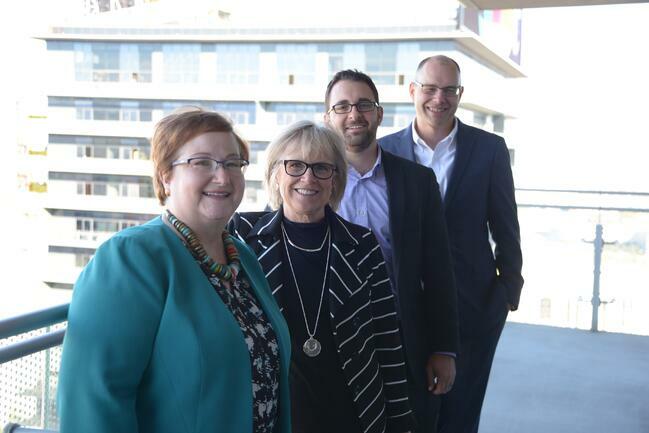 Today I am joined among others by our very own Nick Toman from CEB, also by Jill Konrath, who we all know as the author of some incredible work in sales. She's here today to talk a little bit about things Jill has found in her latest work, More Sales, Less Time, which is a provocative and incredibly valuable title we're excited to hear more about that. We're also here with Lori Richardson. Lori is the CEO of Score More Sales. Lori, thanks for joining us as well. What we're going to do today is the complexity that we're all facing in B2B selling today. We'll break it down to a couple subtopics for our conversation. We're going to start with sales support and this question of when you think about the complexity that's hitting our sales organizations, whether we're thinking of sales leadership or individual sales professionals out there trying to bring in business faced with incredibly complexity across products, their own internal complexity, customer complexity, I think one of the things we'd all agree on is that we've got to find ways to support them in an environment to be more successful. Jill, this is a theme that's very dear to your heart, given you just spent a lot of time writing about this in your new book. Productivity in this kind of complex environment is an incredibly important theme for your work, isn't it? Right. It's incredibly important. It's interesting to me to see how your work is actually complementing what I'm doing, because I know that you're focused on the organizational complexity. One of the things that's been top of mind for me is what's happening from an individual seller's perspective and how complex their job is as a result of the world that they exist in on a daily basis. By that I mean they live in their CRM, they live on their phone, they live online, they live in LinkedIn, they live in ... They're all over the place in all these different tools all day long. What I'm really seeing is just a sheer exhaustion for the kind of work that they have to do, from bouncing back and forth. They're living in an age of distraction and really struggling, but they don't even realize it, because it's just how they're working today. This is so impacting productivity that it is a major source of gain. An organization can easily pick up an hour or two per day per sales rep by changing how they work, not adding anything, but changing how they work. Most sales people I talk to right now are literally talking and working day to night ... morning to night. "First thing in the morning, I roll out of bed and I do email triage and then I go get the coffee going. As soon as I get to the office, I open my computer up and I log-on and boom, my world takes off, and I'm still checking email at 9:30 at night." I completely hear you. Let me get into a little bit about what do we do in this environment to manage that kind of complexity, but first Lori, what are you seeing in this environment? Sure. It's funny, Jill mentioned exhaustion, and the word that came to my mind when I was thinking was frustration, because I work with a lot of companies outside of the technology bubble and these are people in manufacturing and distribution and professional services. They have too many tools, not enough time, and they just can't get everything done, so they're getting extremely frustrated. Couple that with the issues within the company itself. Then there's leadership. They have leadership issues. You put it all together and I think you said it well when you said it's hard to be a seller. Absolutely. I find the same thing we're seeing in our research Nick ... If you think about sort of what we're seeing here at CEB in the Sales Leadership Council and all the work we've done in B2B sales organizations and the complexity of the deals they're doing. We're seeing the themes that, Lori and Jill, you've mentioned at the individual level we see play out at the organizational level, don't we? Yeah. It's almost like a flywheel effect that's happening, where we look at the complexity of the sales reps' world today and organizationally I think you see heads of sales and heads of sales enablement operations want to add support to help their reps cope with this complexity and there's this sort of deep-rooted irony that when we add more tools and add more support and add more people into this equation, it's ultimately backfiring, so you just start this flywheel effect where it just compounds on itself. Some of our latest data, just for example, show us that the average opportunity requires 4.3 colleagues internally to help in some capacity navigate that deal to closure. We see 8.5 technologies required, and this is just on average. There's extreme examples out there where you're talking in some cases a couple dozen tools that might be required to move a deal all the way through the pipeline. The net effect of all that is the average seller has what we would classify as support touch points ... 340 support touch points they have to navigate in a given month to get their job done. It's just this absolute sort of compounding effect, all done with the best of intentions organizationally to help salespeople, but it just adds drag, it adds burden to the sellers' lives. There's a sort of deep ... Just deep-rooted irony to the whole thing. It's very, very difficult to kind of knock that flywheel out of rhythm and get it to slow down again. What do you do in a world when all the help that we've provided to support reps in a very complex environment makes that environment that much more complex? That's a tough question. There's two knock-on effects that I've found in talking about our research with members around the world that I find incredibly fascinating as a researcher and incredibly troubling if you're a sales leader. One is this tendency of individual sales reps struggling in this environment to deal with all this complexity and they kind of look around in the environment, Nick, that you suggested, which is, "I don't see my company as helping me in this environment. I see them in many ways getting in the way of just making it that much more complex. "Clearly it's really hard here. I'll go somewhere else." Of course they go somewhere else, and what do they find? It's equally complex. Everybody loses in that environment, right? The organization loses their sales reps who go somewhere else and they have to replace them. The cost of turnover is just astronomical. Absolutely, and the sales rep is no happier where they've gone. They're just as disengaged in their new job as they were in the old one. This is a lose-lose kind of scenario. The other thing though I find is interesting at the organizational level is that leaders will look at sales reps struggling in this environment and they're quick to judge at the individual level. They'll say, "Wow, this sales rep is really struggling. They must not be able to cut it. They must not be cut out for this environment." We almost immediately diagnose it as an individual skill problem as opposed to an environmental problem. Lori, are you seeing something like that too? Yeah, we do see that. I think when you can put some clear process into place and some clear expectations ... the first thing when someone comes on board in a sales role in your company, they should learn about their buyer. You've been talking about that for two days. If we could focus on the bigger picture and then work down from there here is how we're going to interact with them and here's our playbook and give some real specifics rather than what I've seen too often, which is no set process, no ... It depends on the time of the year, the time of the month, what quarter it is, whether it's the end of the quarter. It gives you results that are not consistent. That's something that I think the organization could definitely work on, and that comes from the top, from leadership. Completely agree. Let's do this. We've kind of laid out the problem. Let's go around the room and think about what's one piece of advice that you might give to either an individual sales professional or to a sales leadership team to help them navigate what we've now outlined as frankly a pretty grim environment, so let's offer some help. Jill, maybe we'll start with you. What I'm really talking to people about these days is the need to rethink their habits and how they're working, because the way they're working isn't working. If you can take a look at somebody that goes into the office and jumps themselves right into email and bounces all day around from here to there, they don't know that what they're doing is not productive. What needs to be done is there needs to literally bean education about how we work in this office, in this company, so that we're able to A, get more done during the course of a day, but I think it even goes beyond that, because right now with the complexity of the sale and the need for salespeople to bring their customers ideas, insights and information all the time, and for the need for salespeople to be strategic to do this, we need salespeople who are at the top of their game mentally. What happens if somebody is bouncing around, it's actually hurting their ability to be strategic. Their intelligence goes down. They're stupider than they were before, and I literally means there's research that shows that their IQ literally goes down. A Harvard MBA who's bouncing around and texting and emails during the course of a day can go from a Harvard MBA brain to an eight-year-old brain because they're literally bouncing, which means they're not strategic, they're not thinking the thoughts that they need to be thinking in order to capture somebody's attention, to keep it, to move things along. You asked me what do I recommend. Yeah. Give me a piece of advice. I'm already toast. I don't even turn my light on and I'm already doing emails. Yeah, and how much of that is urgent right now? You just jumped into somebody else's agenda. You jumped into somebody else's agenda, and boom, you go down the rabbit hole doing things that other people set up for you today, as opposed to taking a few minutes at the beginning of the day to think, "Okay, what are the three most important things I need to focus on today," and getting to work on at least one of them. I can't tell you how many customers really don't need you to respond right away. I mean they honestly don't, and yet research shows that the average person is responding to emails within six seconds. It's killing their mental capacity. And you know that they know you opened it too. The root of this thinking comes from is often more in product development environments where companies focus on developing really simple products and they stay extremely focused on "What does a product really need to do and what does it not need to do. What's additive or extra?" You think about products like Apple or Google's products, and you see companies taking that philosophy or that way of thinking into their sales operations, into the sales tools, into the ecosystem of support they're putting in front of their front line teams and really saying, "Look, how can we ruthlessly simplify the support we're offering to the points where reps need that support most and anything else that's additive or noise or marginally impactful, let's be judicious about getting that out of the system." Even if it looks good on paper? Even if it looks good on paper and even if the ROI is so incredibly clear on paper, because what happens on paper and what happens in reality often becomes very, very disjointed. I love this notion of ruthlessly simplifying. In fact, companies we've worked with have looked at the ecosystem of support and said, "Gee, we have 25, 30 legacy systems. Our goal is to get that down to three systems where workflow occurs." CDW is one of the companies we've seen be judicious about moving everything as much as they can in their case into CRM to create a common, simple workflow that's supported by the CRM tool. One where they aren't moving in and out of different disparate systems and being just as judicious as they can about keeping it easy for the sellers to engage with what they need to engage with and nothing more. The same word comes together in my mind for each of them, which is the word focus. What can we do to focus the organization on those few things that simplify my perspective? Yes, everything is important, it's all important, but it's these two things that matter most, and, "What can I cut out, because it can't all be important." It can't all be important, and it can't be all important now. The question to ask is "What is important now and what can wait for later?" and then to focus on the most important thing at this particular moment in time. Who determines that, what's most important? I think the leadership team has to really help the salespeople. I don't think it's a question of leaving things up to sales, because you get a hundred different ... A thousand different opinions. Even deals, which deals are most important? Do you have a way of measuring them and rating them? If you don't, people are going to be all over the board. There's just so much going on. Lori, let me come back to you. You started a little bit with the customer, so if you were to think about that one sort of practical, tactical tip to help either sales reps or sales organizations in this kind of complex environment, what would you boil it down to? Would you go back to the customer and start there or would you do something else? I'd have to go internally. I have to say when I saw all the touchpoints... I sat by someone yesterday who had 500 touch points and I almost cried. It's like when you're on a sports team at the away game and everyone is booing you—that's fine. But when you're at the home game and they're booing you, that's a problem. You've got to get the support internally, and I think a lot of companies could work on that. I think you're right. If we think about sort of taking this part of our discussion and putting it together, we've landed in a couple places. One is more is not always better. In fact, more is nothing more than more in many cases, so the question is how do we operate in an environment of less, because that is in fact the way that we're going to win in this world? How do we simply the seller's life? How do we simplify the sales process? How do we simplify everything that we're doing, because if we don't, we're actually going to wind up just exacerbating the very problem we're looking to solve. Okay. All right. With that in mind, let's close this first part of our conversation. Thank you for joining us on that. Stay tuned for part two next.